Be inspired by these Save the Date Postcards, which are perfect if you're planning a destination wedding. 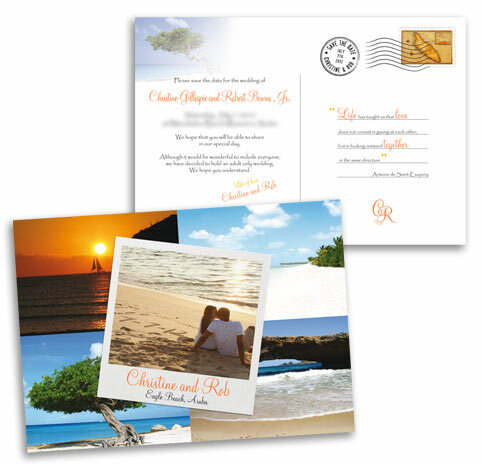 A fun way to give details of your upcoming wedding before sending out formal invitations. Save the Date cards designed to look like postcards will act a reminder for your guests and can even be supplied as magnets for sticking on their fridge! Click on the images below to see more details about each design (please note these pages are currently being updated so if there is no link available please call back soon or contact me directly to see more examples). Want your Save the Date to look like an authentic postcard? I can design your very own postmark complete with your names, the date of your wedding or anything else you might like to include. 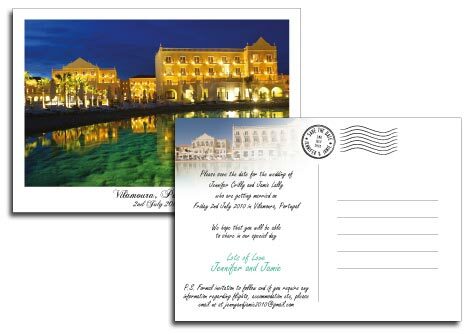 If you like the idea of Save the Date Postcards but weren't planning to send Save the Dates, don't worry, why not think about sending your guests Postcard Invitations to the return party after your destination wedding? Another fabulous use for Postcards is as a Thank You Card sent after your big day. You can supply photos of the wedding to share with those who could or couldn't make it. Postcards are printed onto Matt card so a handwritten message can easily be written on the back. Alturnatively you could choose to have a personal (generic) message printed onto the back of each card to save you some time. Personalised thank you cards which include pictures of the wedding are so much more thoughtful and will be really appreciated by your guests. Consider them to be a keepsake people will treasure and design them to be as personal as you like. There's also a 10% discount on multiple orders so Postcards work out to be a very cost effective addition to your unqiue wedding stationery. Have another idea you want to discuss? Click here to contact me or here to return to the Home Page.